Listed below are the most recent posts to the website. Click on any item (in blue font) to access our latest reports, press releases, and news items. Or use the menu to the right to browse current and archived reports, articles featuring IdeaWorksCompany research, and current and archived press releases. CarTrawler-sponsored analysis shows ancillary revenue has gone beyond tilting the bottom line toward profitability and is now a core component of revenue for fiscally healthy airlines. Every year IdeaWorksCompany searches for disclosures of financial results which qualify as ancillary revenue for airlines all over the globe. Annual reports, investor presentations, financial press releases, and quotes attributed to senior executives all qualify as sources in the data collection process. The annual IdeaWorks survey of award availability shows that while overall ability to find flights at basic “saver” levels was about the same as last year at 25 airlines, American Airlines significantly relaxed its grip on award seats, especially to Hawaii and Europe. American had availability on 80% of the possible trips IdeaWorks checked, up from about 50% last year. That moved American from the lowest award-seat availability among U.S. airlines to No. 3 behind Southwest and JetBlue . United made changes, too, and its availability was up more than 10 percentage points to 76% overall. The 9th annual Reward Seat Availability Survey ─ sponsored by CarTrawler ─ also finds survey newcomers Norwegian and China Eastern ranked in the top 8 among 25 airlines. 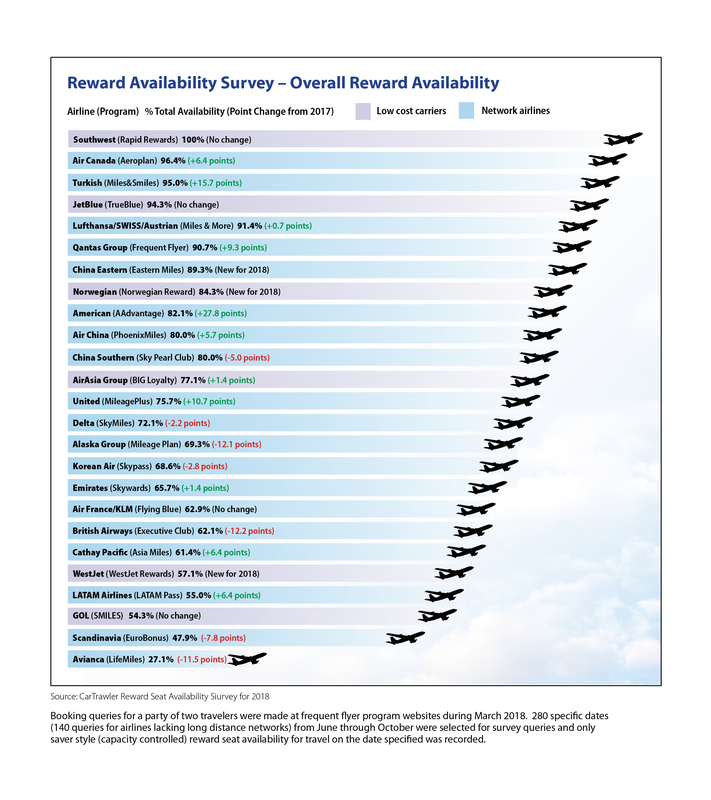 The CarTrawler Reward Seat Availability Survey answers the question, “How easy is redemption for the basic and most popular reward type offered by the world’s top airlines?” The 25 carriers in the survey remained almost the same as 2017, with China Eastern, Norwegian, and WestJet as newcomers for 2018. Click here for 2018 Worldwide Reward Survey FAQs. Click here for infographic summary (JPG file) of key findings. Mr. Sorensen, who runs the IdeaWorksCompany airline revenue consultancy, ran hundreds of simulations to come up with the following data for an award seat availability study he does with the rental site CarTrawler: The average value per mile redeemed for economy class travel ranges from 0.7 cents to 1.4 cents, depending on the airline. For long-distance business class seats, it ranges from 1.5 cents to 2.4 cents. So a 2 percent cash-back card would more often be a better value. Few airlines are making the most of the bookings and ancillary potential of mobile platforms according to a report. Initiatives by those airlines at the lead show that mobile-first strategies can work exceptionally well. The IdeaWorks and CarTrawler report points to the rising trend of consumers preferring mobile interactions, with 3.5% more mobile phone accounts than there are people in the world. The latest report from IdeaWorksCompany reviews the mobile applications offered by the world’s largest LCCs as measured by passengers flown. Theoretically, the mobile applications evaluated should represent state-of-the-art examples of ancillary revenue excellence. After all, the LCC category should naturally excel in the art of ancillary revenue. This report is part of the CarTrawler Airline Intelligence Series for 2018. IdeaWorksCompany finds Norwegian, Pegasus, Ryanair, and Wizz Air provide great mobile retailing examples. The latest report from IdeaWorksCompany reviews the mobile applications offered by the world’s largest LCCs as measured by passengers flown. After all, the LCC category should naturally excel in the art of ancillary revenue. As seats get narrower, airlines are getting fatter off bag fees, meals and other extras. Airlines globally were projected to pull in a record $82 billion in ancillary revenue last year, up nearly fourfold from 2010. Passengers grumble, but such additional revenue is a boost to carrier profitability–and in turn gets invested in new planes, in-flight entertainment and airport waiting areas.